I feel that when it comes to planning things, in particular holidays, I'm not afraid to say that I think I'm pretty good. I only really got into planning in 2013 when we went on a family holiday to Florida, since then I've planned another trip to Florida, smaller European holidays, city breaks and I'm currently in the process of planning a NY trip and yet another Florida holiday. I'm pleased to say that each holiday I've created itineraries for in the past have all ran smoothly and people have commented that I organised everything perfectly. Of course, all of this takes time and effort, however I love doing it. My worst nightmare is spending a lot of money to go somewhere, then arriving and wandering around aimlessly, not knowing where to go, wasting time and money in poor restaurants and taking longer routes to places (and suffering in the process!) all because no organisation was put into it. Of course there are certain holidays that I probably wouldn't plan so meticulously for, such as sun/beach holidays. Although I still wouldn't be able to resist planning for restaurants (I do that in my own hometown, never mind somewhere new!). Over the years, I've built up a process in my head of how I plan holidays, so I thought I'd share them with you! 1. Buy a pocket travel guide of the place you're visiting. 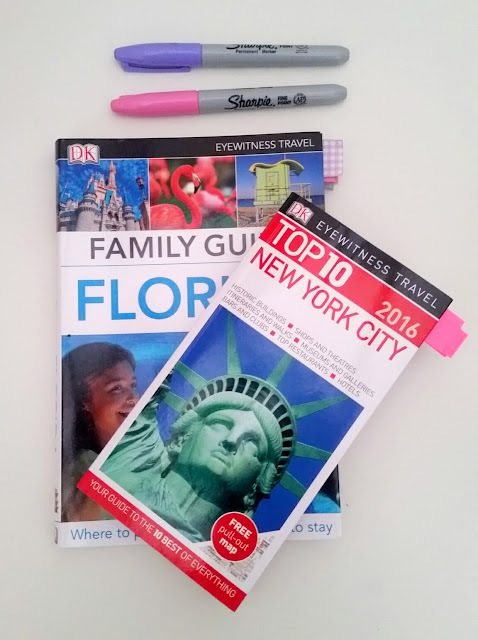 My go-to brand are the DK travel guides, the smaller 'top 10' books include a handy laminated pull out map that you can detach from the book and throw in your handbag so you always have a reference guide. I think our NY map is definitely going to get over-used on our upcoming trip! The larger books from the DK range have more in-depth detail about the country you are visiting, however in my opinion, these would suit people that are travelling for a lengthy amount of time, or going on long road trips. For an average 2 week break, the top 10 guides will be just fine. If you don't want to spend money on books, you could find all of this information out on the internet, but collating all the information together then making note of it would be a little hassle, so personally the book and map is worth the £7.99 fee. 2. TripAdvisor is your friend. For everything I plan or book, I turn to this website. I know there can be a lot of negative comments on there, however I've learnt to read through the first few pages of something, then take an average of what people are saying about a particular place. If its 90% positive, then I'm likely to still visit, however if its 90% negative, I'd probably think again. You have to read the negatives because once you sieve through their 'issues', most times you'll realise that it was just bad luck on their part, and the chances of you experiencing similar are slim. Tripadvisor also offer a 'Top 10' of every area, including restaurants, things to do etc. Always check through tripadvisor's traveller photos too. Official websites for hotels and restaurants can often give a very different 'view' on their business. Photos can be overly edited to make everything look almost perfect. However looking at travellers photos gives you a realistic view of what it really looks like! 3. Be realistic with timing. If you've planned 1 day to be very active, out the hotel by 8am, not back till 11pm, chances are, you'll be tired the next day and want a small lie-in to rest, so booking a breakfast reservation for 8am might not be wise! Its so tempting to squash as much as you possibly can into the days in which you are at your destination, however sometimes this can be a bad move, especially if you don't usually lead an active lifestyle at home. A lot of walking can be torture on your feet and will ruin your holiday if you over-do it (I've been there!). Try and allow for a few chill out days whereby you might have a lay in, then take it easy and not venture too far and do anything overly strenuous. If you can't afford to lose a few days, maybe a morning or afternoon, just to allow your body to recoup. 4. Depending on your destination, booking activities/restaurant tables is often essential, especially if its a Disney holiday. First-timers to Disney don't often realise how important it is to plan before. If you expect to turn up on the day and walk straight into a Disney restaurant for table service, you'll be very lucky! I will be booking for certain landmarks for our upcoming trip to NY too. It's not worth the disappointment otherwise. 5. Checking distances. I am forever referring to google maps if I've found somewhere I'd like to eat or visit. I see how close it is in relation to the hotel or other plans that we have on the same day to see if it is a viable option. It also helps to distinguish if its in walking distance or if we'd need to grab a taxi. If its quite a distance, try and incorporate it with other plans in that area so you're killing 2 birds with 1 stone as opposed to making a few unnecessary trips. Have you got any upcoming trips that you're planning for? Let me know in the comments below! I love to talk travel!